Every year there are 8 morning markets and 1 beautiful enlighten evening market with a big flee market. The morning markets are held on Wednesdays from 10.30 until 12.30 hours and the evening market is held on a Saturday from 21.00 until 23.00 hours. 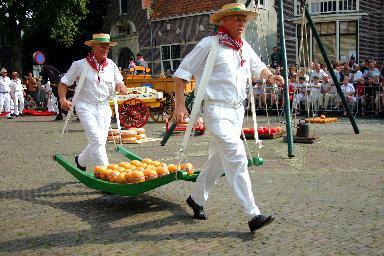 Edam was granted the right to hold a free market in 1520 by the Hapsburg emperor Charles V. 50 years later, Prince William of Orange was to grant right of ‘Cheese weighing house’ in perpetuity. The present weighing house was built in 1778 and cheese markets were always held until 1922. However, the appearance of cheese factories signalled the end of the farm cheese markets. At the cheese market you will see the cheese transported to the market by boat or by horse-drawn cart, as it was in the olden days. At the market, the farmer has his cheese unloaded by special cheese carriers – in days gone by they were members of a special cheese bearers guild. The traders test the cheese by drilling holes in it and determine the quality and hence the price on the basis of this sample. 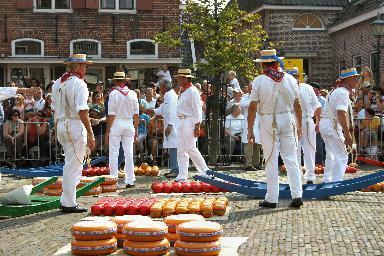 If a batch goes down well with the trader, the cheese bearers carry it to the scales in the cheese weigh house on a handbarrow.